To fulfill our longing to share and provide some background, keep reading to learn how we use this technique. Many moons ago we wanted some variety in eliciting feedback, collectively sharing that feedback and exploring action possibilities. We decided to create a variation of World Café whereby areas of the room are used to focus on a specific retrospective topic. It has proven to be very useful for iteration and project retrospectives as well as for retrospection of training and conference events. Typically we use all 4 L’s. But whichever you choose to use, we recommend that you don’t drop the “longed for”, which can provide some very powerful data! 1. Hang four posters, one for each L, around the room, titled appropriately. 2. Ask people to individually jot down what they Liked, Learned, Lacked, and Longed For – one per sticky note. When the time is up (3-4 minutes), they silently place their notes on each poster. 3. Divide the group into four subgroups; assign an “L” poster to each subgroup. They read all the notes, cluster as appropriate and identify themes. 4. Each team reports out on the themes. 5. The entire group decides how they might use the data. For example, ask, “How can we satisfy the ‘lacked’ or ‘longed for’ items? 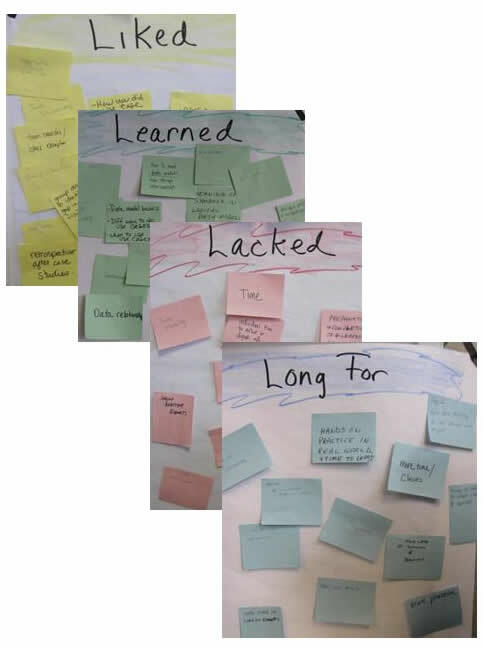 Use color stickies, one color per “L”. See our photo on this blog for an example of how we used color. Select a subset of the L’s, but remember the power of “longed for”. At step 2: Instead of each person writing their own 4 L’s, split group into 4 teams and assign each team to one of the L’s. Each team collectively identifies, discusses and writes points. (Plan for more time to allow for discussion.) After posting their items onto their assigned “L” poster, ask teams to rotate to each of the other 3 posters, adding items that occur to them. After step 3: Facilitate a “gallery walk around” whereby people walk around and read what’s on the 3 other posters. In the spirit of learning, we’d like to hear how you use this retrospective technique! If you need to faciliate the 4L retro technique on a distributed team, try Retrium. I’ve posted your retrospective plan on the Agile Retrospective Resource wiki (and credited). Hope you don’t mind but if you do please let me know and I’ll remove it. the technique was familiar; applying a seasonal theme kept it fresh! I’ve used GroupMap for their 4 L retrospective. Good for online teams or when you want to get anonymous, honest answers fast. I didn’t have to worry about post it notes and whiteboards. We could also vote on key actions points to decide on actions to take forward. We could then go through each of the sections to discuss and work out what we wanted to do for the next time. thanks for sharing this tool for distributed teams using 4L (the link is http://www.groupmap.com/). thanks for the heads up, we think we have it all set.